Do you feel like summer is the perfect time to give your home a little update? You may have already run through the basic ideas: planting a garden, giving your house a fresh coat of paint, or doing a little landscaping. So what is there left to do? Let Carroll Awning be the first to suggest the addition of a stylish, practical awning to your home this summer. Whether you choose a coated cotton, woven, or vinyl awning, you are guaranteed to pick an awning that will add something special to your home this summer. The experts at Carroll Awning can work with you to help you select an awning that is the right color and style for your home and that will give it the updated look that you want. You are virtually unlimited in your options for awning installation; awnings can be added above windows, doors, patios and decks, or as a canopy over a basement stairway. No matter where your awning is on your home, it is sure to be an eye-catching addition. Not only do awnings bring aesthetic appeal to your home, but they also protect it during the summer. Awnings provide vital shade and sun exposure protection to your home; you will be able to keep out the sun’s harshest rays in those late summer afternoons, which in turn will keep your home cool and comfortable. The shade from an awning on a patio or deck could help keep outdoor furniture cool, so that when you go to use it, you don’t scorch your skin on hot metal or plastic! The addition of an awning can also mean the addition of value to your home. If you know that you are looking to put your home on the market soon, an awning might be just the thing to help it stand out as the dream home of a potential buyer! An awning is the perfect summer home makeover idea for you, so what are you waiting for? 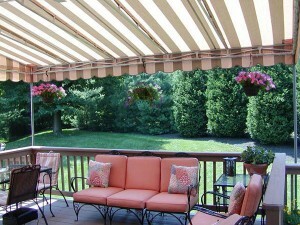 Call on the experts at Carroll Awning Company today for more information.